The Fault in Our Stars is a book that demands to be talked about. All of my closest friends have read this book--even one who says they rarely read because they can never get into books. She read the entire novel in less than 24 hours--and it has affected each of us in different ways. Why is this novel so popular and widely read? Well, for one, John Green's portrayal of teenagers is very accurate. The teenagers in this book are witty, intelligent, and interesting, just like most are in real life. For example, when one of Augustus's and Hazel's friends goes blind, Augustus starts making up a bunch of puns. I think that's completely realistic, and if one of my friends went blind, we'd surely be doing the same. There is humor and sarcasm everywhere. There were many times where I actually laughed out loud while reading. Secondly, John Green balances out funny moments with thought-provoking ones. I like that. I think if an author can make a book about a serious topic both funny and interesting then they're doing something right. Although the main characters in this book have varying types of cancer, they have not become their disease. They don't let their disease define them as a person. On page 32, Augustus asks Hazel, "...what's your story?" And Hazel replies with, "I already told you my story. I was diagnosed when--"
Then Augustus says, "No, not your cancer story. Your story. Interests, hobbies, passions, weird fetishes, etcetera." I love that point because there is so much more to a person than a disease or disorder they have. 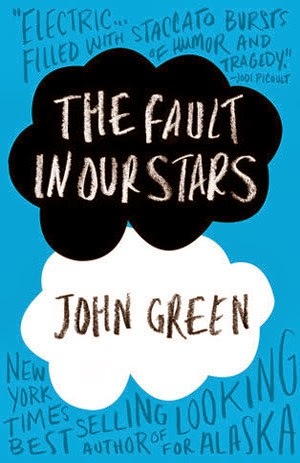 The Fault in Our Stars is definitely a bittersweet novel, but it is one that is worth the read. On page 33, Hazel says, "Sometimes, you read a book and it fills you with this weird evangelical zeal, and you become convinced that the shattered world will never be put back together unless all living humans read the book." I think this is one of those books. I love this book and read have read it twice. Received the hardcover as a gift from my mom. I haven't read any books by John Green yet, but want to. You're convincing me that this will be the one. Thanks. I didn't enjoy it at all (clearly in a minority - I reviewed it critically on my blog) but I get what you're saying, it's a good review. Are any of his other books worth reading? I can't understand what the fuss is all about to be honest.